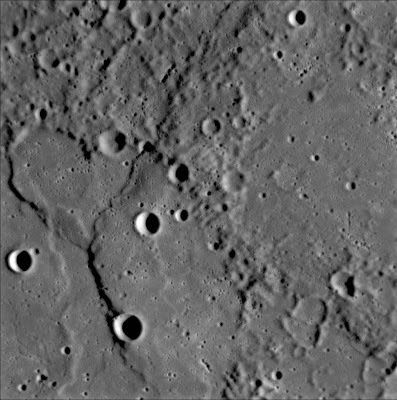 As Messenger made its first of three flybys of the planet Mercury, it snapped nearly 1200 images. As these images come back, the most interesting ones will be added to this page, along with a brief description. This stunning wide shot from Messenger shows a relatively young crater, with fresh crater chains around it. These crater chains are often created by the ejecta thrown from the crater at impact, or by fragments of the main impactor. 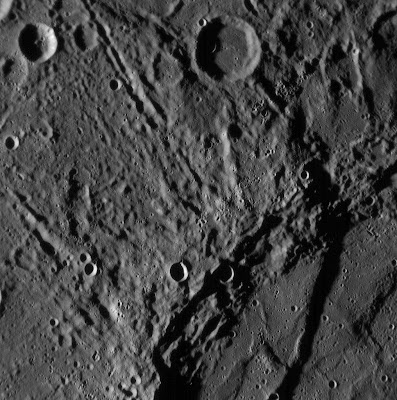 This image shows a complex array of cliffs on the surface of Mercury. In this image, the sun is located to the right side. This means that the ridges seen step downward as one moves from right to left. These ridges were most likely formed when the lava flows that formed maria, or volcanic seas, cooled and started to crack and wrinkle. 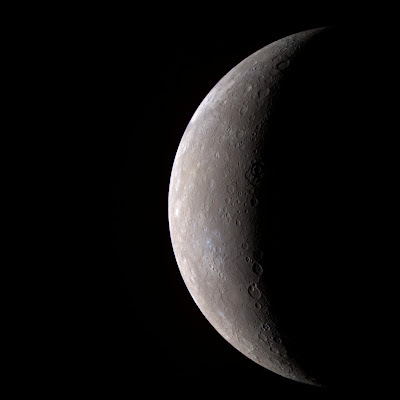 This image shows a mosiac of most of the sunlit portion of Mercury not previously imaged. 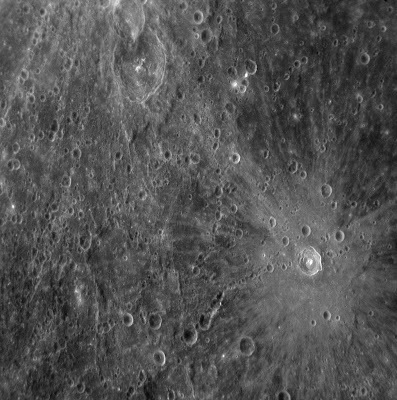 Note the double-ringed crater that has been filled in. This indicates a volcanic past on Mercury. Astronomers can use this to get an understanding of Mercury's geological past. By counting the craters in the lava-filled crater, astronomers can even estimate its age. 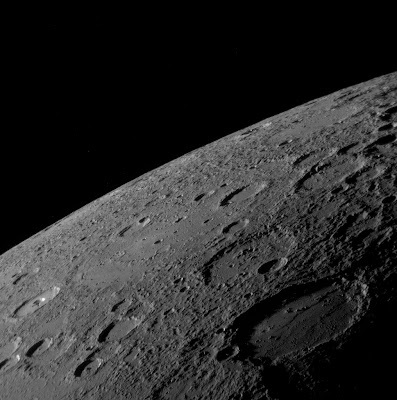 This is one of the most "close-up" images of Mercury yet. It shows craters as small as 300 yards in diameter. This image was taken from an altitude of only 3,600 miles and shows an area approximately 100 miles wide. This image will also help planetary geologists determine Mercury's geological past. The crater seen in this image is a previously unseen crater. Note the highly defined ejecta, the material ejected upon impact, seen as lightly colored rays around the crater. 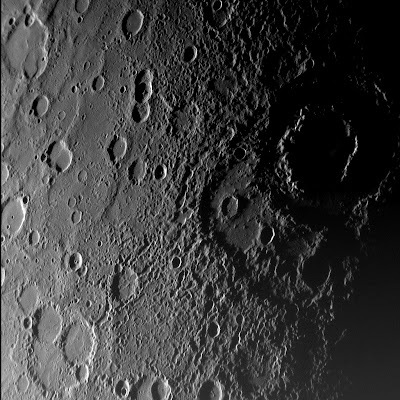 Also notice the chain of craters nearby, which may be related to the main crater. As meteors approach a planet, the often break apart, leaving trails such as the one seen here. This is possibly my favorite Messenger image yet, most probably because it gives you a good sense of the image as being a planet, not just some old craters. This image of the Mercurian horizon shows both high plains structures, seen as smoother areas and massive craters, with ejecta covering the surrounding rocky area. The above image has a resolution of approximately 6 miles, meaning objects on Mercury's surface as small as six miles can be seen. 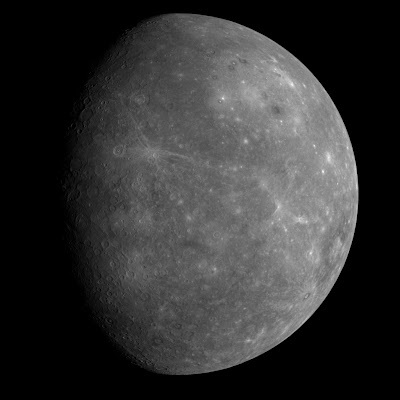 This image is so interesting to astronomers because this is the first time this side of Mercury has been imaged in high-resolution. Most of the features visible here have never been seen before. The bright spots in the upper right limb of the planet are part of the great Caloris Basin, one of the largest impact basins in the entire solar system. This is the first time the western side of the Caloris Basin has been seen. This of course is exciting news! 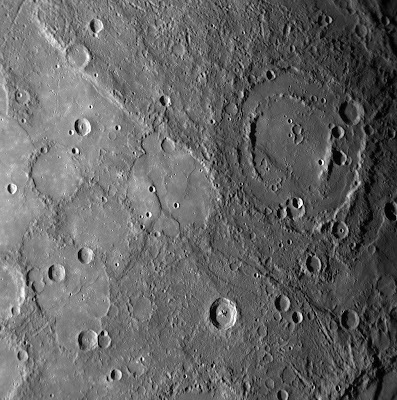 This image of Mercury shows a more detailed view of the surface. This image was taken from a distance of approximately 11,000 miles, on January 14th, 2008. The resolution of this image is less than one mile, so some craters shown are less than one mile in diameter. The large crater in shadow on the right side of the image is Vivaldi, discovered during the Mariner 10 mission and named after the Italian classical composer of the same name. THESE ARE AWESOME IMAGES. This website brings many interesting things together that would otherwise have to be searched for. Thanks. This is very much a new operate in progress every time My spouse and I discover individual who can be additional lovely when compared with all of these Let me put your ex along with click here Cash Advance Cheers pertaining to expressing your helpful article.